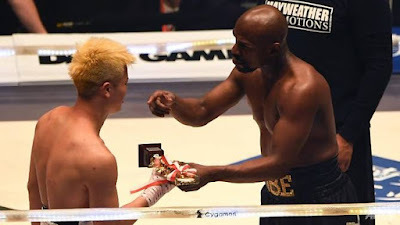 Floyd "Money" Mayweather beat Japanese kickboxing phenomenon Tenshin Nasukawa by a technical knockout on Monday (Dec 31) after just two minutes of a New Year's Eve "exhibition" bout that brought the US boxing superstar out of retirement for a big pay day. "Money" Mayweather has hinted on social media he was pocketing US$9 million for the fight, meaning he earned around US$4.5 million per minute for the spectacle. "I'm still retired. I don't look forward to coming back to boxing but I did this just to entertain the fans in Japan," added the 41-year-old.